Wow!! 85 pages of Fairy Tale Fun with The Gingerbread Man! Designed just for KINDERGARTEN and FIRSTIES.... Also perfect for a special education classroom or a SLP setting! This is a very comprehensive set of materials to go along with the story and includes many different levels for your students! Three of my Fairy Tale Units Bundled Together! This is a HUGE set of differentiated materials to go along with the classic story The Ugly Duckling! 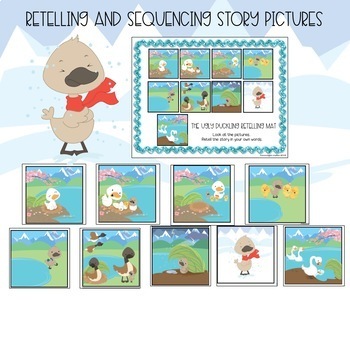 This set has a TON of activities for retelling and sequencing the story! Three Emergent Readers: one with more text, less text and a wordless reader! The preview shows all of the materials! This is a BIG pack of Three Little Pigs Learning Fun! There are 121 PAGES of materials to give your kiddos a week or two of FAIRY TALE FUN! DIFFERENTIATED FOR your students needs! The first one has more text for readers who are ready for a "meatier" text! The second one has less text for readers who need a "simple" amount of text! The third one is a wordless book...perfect for those just learning to retell a story! The graphics in this set are by Kari Bolt...and they are the perfect support for your little readers! Tons of details provide a lot of support for children who are just learning to read and relying on great graphics to help them navigate through text! Wow!! 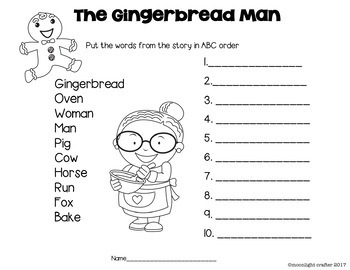 85 pages of Fairy Tale Fun with The Gingerbread Man! Designed just for KINDERGARTEN and FIRSTIES.... Also perfect for a special education classroom or a SLP setting! This is a very comprehensive set of materials to go along with the story and includes many different levels for your students! This unit follows the story sequence and characters from the book Retold by Louise Martin and Illustrated by Gail Yerrill...I have included a link for a video reading of the story in case you can't find a copy of the book! This set of materials also includes a reader for your kids that follows the sequence of that version. **Because there are so many different versions of this classic tale, it makes putting together a set of materials a little more difficult. I have researched different popular books available for The Gingerbread Man and I decided to include picture sequencing cards for THREE OTHER VERSIONS OF THE STORY IN ADDITION TO THE VERSION I PICKED TO USE! That way if you have a copy of one of these, you can use the picture cards for sequencing and compare and contrast activities! 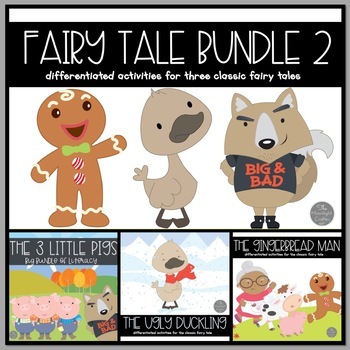 This is a very comprehensive set of materials to go along with the fairy tale! The GRAPHICS are the BEST!!! Anything you need, just send me a message through my store pages question and answer tab...I promise to respond quickly and try to get you whatever you may need! Everything is represented in the preview...so please take a look! Every class is different and I want you to be able to see every page, so you can make sure it's a good fit for you and your students!